Western Canada is one of the world’s most fascinating and breathtaking destinations, popular among tourists and residents alike. This region hosts many great cities of Canada that have excellent attractions and facilities, offering visitors an experience of a lifetime. Apart from the many attractions and destinations, the cities also have other facilities, such as shopping malls, betting casinos and sporting venues, making Western Canada a haven for all that you may require during your vacation. This is the largest city of the Alberta province and owes its rapid growth to its status as the center of Canada’s oil industry. The area is characterized by many mountains due to its proximity to the Rocky Mountain range of the region. The city has also conserved many of its traditional aspects and boasts a collection of theater companies and museums. Sports enthusiasts will love this place as the Rocky Mountains provide a great venue for hosting winter sports. 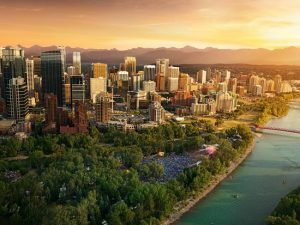 There is so much to do in Calgary and it is, therefore, important to make advanced plans before embarking on your vacation. Engaging the services of trusted tour operators will help you save on time and ensure that you make well-informed travel decisions. Edmonton is Alberta’s capital city and one of the most visited cities in western Canada. During the summer, the city experiences 18 hours of sunlight during the day, making it ideal for outdoor events that run late into the evening and other sporting activities. For shopping lovers, this city offers a variety of options, as it has some of the largest shopping malls in Canada. The Edmonton river valley is one of the best attractions in the city and it hosts more than 20 parks that are interconnected. Sitting on nearly 19,000 acres of land, the park is 22 times larger than New York’s Central Park, and is ideal for picnics, biking, running and, during the winter, Snowshoeing and skiing are common activities. Vancouver is one of the most exciting cities in Canada with its beautiful beach line and its rugged mountains, that offer great attractions to visitors. The city has been voted as one of the most livable cities in the world and it’s the hub of America’s entertainment industry, with movies such as 50 Shades of Grey and X-Men being filmed in the region. The Capilano Suspension Bridge, which is 140 meters long and hangs 70 meters above the Capilano River, is one of the must-visit attractions in the city. If you are planning for more than a day’s vacation to the city, there are great camping and lodging facilities that will meet your needs. Contact some of the local tour operators in Western Canada for an awesome holiday experience.